The organ was built by J.C.Bishop and dates from about 1830. Bishop made at least two organs at Sarsden, though this one is not mentioned in the archive (Laurence Elvin Bishop and Son Organ Builders (Lincoln 1984), see pp112-3). Bishop first supplied a second-hand organ in 1819, then a barrel organ for the church in 1824 (one of his largest models costing £200 – a lot for a barrel organ) and this organ. Although this organ is not documented, it is undoubtedly by Bishop, and must date from 1830 or shortly thereafter. 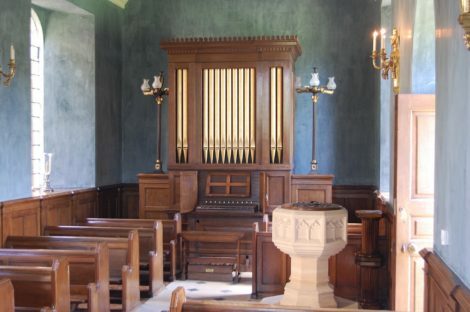 It was moved from the house in 1896, when the church was restored, presumably because the tunes on the barrel organ were by then old-fashioned, and an organist was reliably available. Bishop was an innovator in his early career (see Nicholas Thistlethwaite The early career of J.C.Bishop organ builder 1807-29 Journal of the British Institute of Organ Studies vol25 pp6-29, including a reproduction of a portrait of JCB painted in 1831). He invented the concussion bellows, an early example of which is to be found in this organ. He also started to re-introduce open wood stops, called Claribella in this case. He helped to develop the swell box, in this case using louvres for swell shutters instead of a sliding front. There are characteristics of Bishop’s organ building practice in the organ: the stop knob discs have his characteristic font and ornamental lines above and below the stop names. Both the manual keys and the pedal keys can be slid into the case. The stops are in a row above the keys, and activate the sliders in the middle of the chest, through the upperboards. The organ is in almost completely original condition, which is unusual for chamber organs subsequently moved into churches. Unfortunately the two reed stops have been removed though there are plans to replace them with new ones in Bishop’s style. The metal pipes have been cut down and are now tuned with tuning slides. The organ has suffered recently from an over-heated and de-humidified atmosphere. The exceptionally long keys had twisted so that they were jammed tight, the wind system and the wind chest had sprung leaks so that it was impossible to produce noises. The organ now speaks beautifully into the generous acoustic of this little estate church. It was restored through the generosity of the current owner, Tony Gallagher.